For today's Fabric Friday, I thought I would delve into the world of lace. Since finishing up my besotted blouse last week, I thought it would be great to highlight laces. Today's lace: Re-embroidered lace! I thought I would do this one first as it's the same type that I used in my besotted blouse. Lace get's a pretty bad rap, I think, as being hard to work with. It's really not. Like really, really. I daresay that lace is fairly easy to work with. It just requires a special skill set - not unlike how you have special skills/techniques for knits. Laces are like that. 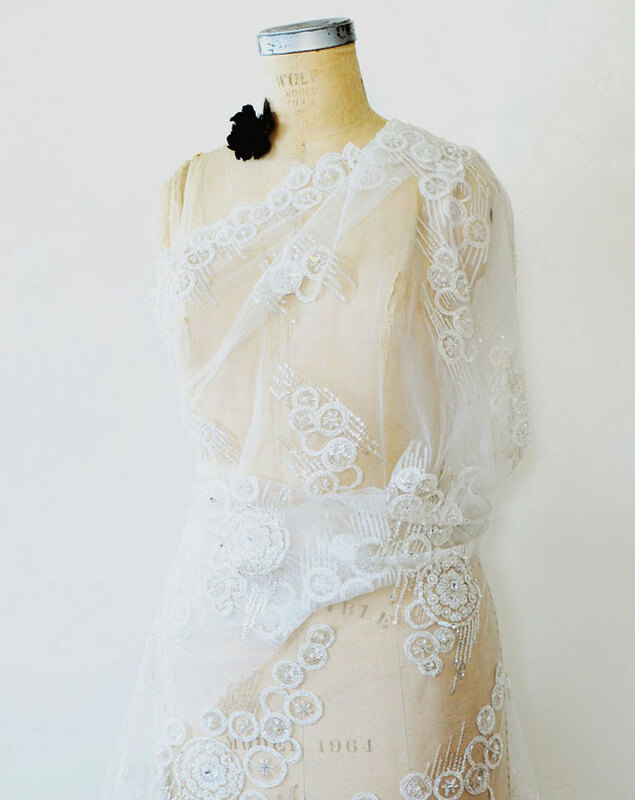 You need to pick sewing patterns that cater to the lace. 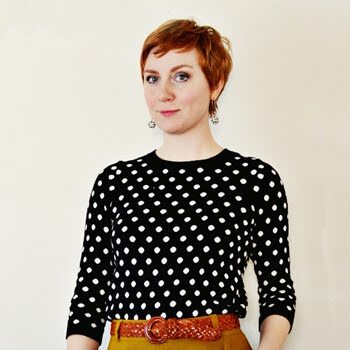 Case in point: my besotted lace and silk blouse. I created the pattern especially for the lace I was using. The lace is beaded and as I was looking at the lace, I realized that I didn't want to mess with a dart anywhere in the front of the bodice. Additionally, I didn't want to mess with a curved hem in the front either. So those two things got tossed in favor of something simpler to sew with this fabric. To begin, we need to know what netting is and how it's utilized in these laces. The netting I'm showing you is English Net. It is the flowy and soft kind - not the stiff kind. The soft and flowy kind is the kind that is quite a bit harder to get your hands on, or so I have found. English Net is really, just a simple netting that is usually made from silk - but the silk version is outrageously expensive (like $150 per yard). The version I'm showing here is a rayon/nylon blend. The rayon gives it some nice drape and the nylon gives it softness. 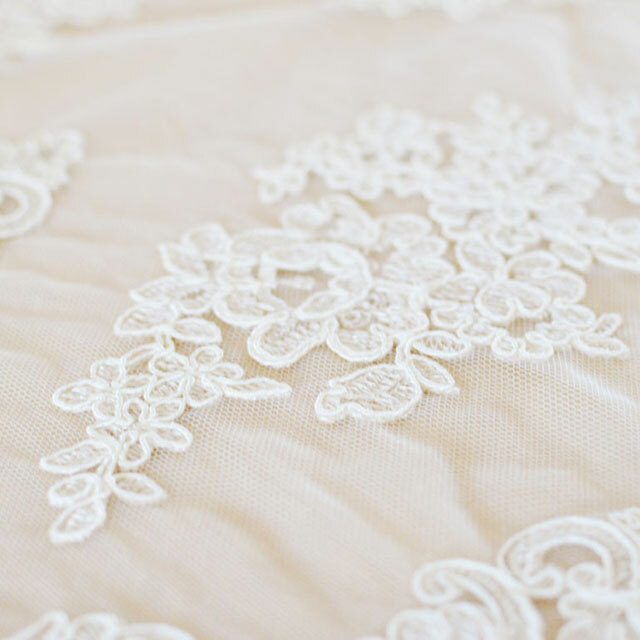 With re-embroidered lace, you have English Net that has been embroidered with motif - usually florals. The embroidery is then corded. Re-embroidered laces can also be beaded. These can be quite lux with glass beads, sequins and rhinestones. Fine laces - or at least the ones I normally see - have a finished scallop running along both selvedge edges. Sometimes the scallop is not the same on both sides, like in the case of a border motif style lace. When you're working with lace, the cross grain usually becomes the new straight of grain so that you can better utilize these scallop edges - but don't let that fool you. 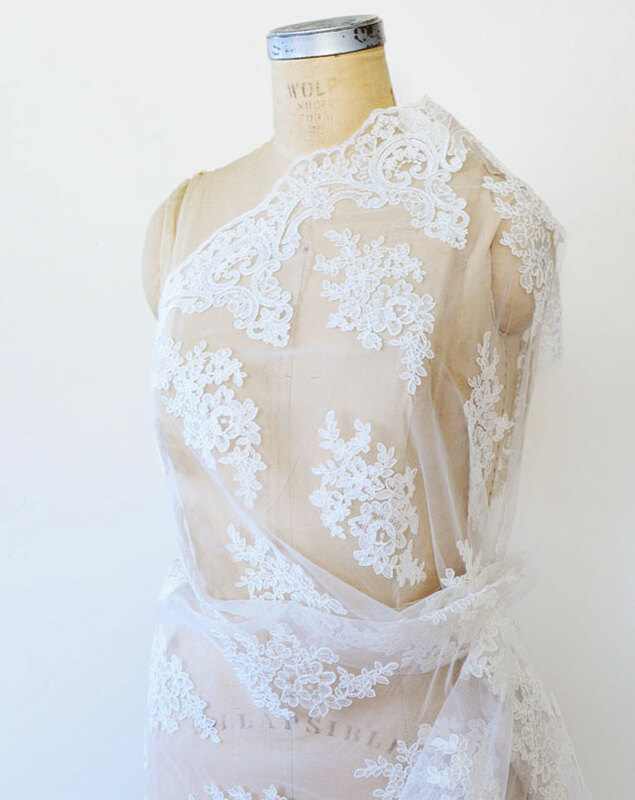 Lace doesn't have a grain, so you could do some wild things with it if you wanted. That said, there is usually more give in the cross grain than in the straight of grain. Additionally, lace doesn't fray or unravel so you can cut the motifs in the lace apart and slap those on different garments in different places if you wanted. Use all that to your advantage. Have you worked with lace before? 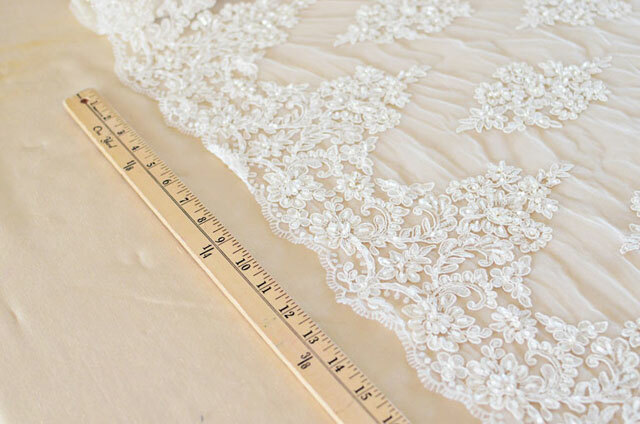 What gives you pause when it comes to lace fabric? Find more Fabric Friday posts here! I love the purchased that I got from you. It's beautiful and I am wanting more. I love lace but worry that it looks too bridal. Any suggestions for how to use it in a more contemporary fashion? Since I sew mostly lingerie nowadays, I've become comfortable with sewing lace. I wouldn't use English lace for any of my bras or undies, but it was interested learning about it. Thanks Sunni! Thanks Lady ID. Love the idea of a short dress out of sequined lace. Maybe an art deco style of lace if I can find it. 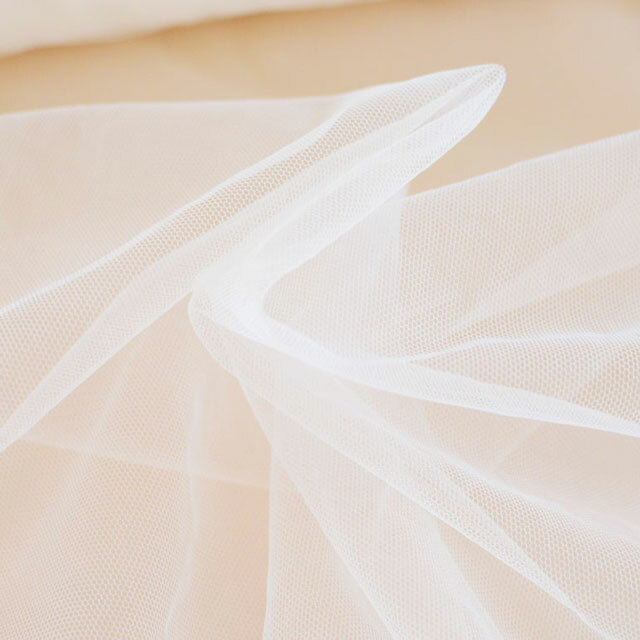 I had a wedding-gown that was all embroidered lace, with a long train and scalloped edges. I fell in love with it and bought it second hand. I knew I would have to shorten it, but I I thought the lace was woven this way. Oh, the naïveté. When I looked closer, I had at least sixty seperate pieces of lace and countless beads, pearls and sequins on my hand. Something to sew back on in the evenings by hand. Almost 7 months later I still find sequins in the corners. But it has given me appreciation for this fabric and why it is so expensive. I have four separate posts about the dress. This one is the second in the series. I hope they are helpful to anyone sewing with lace.